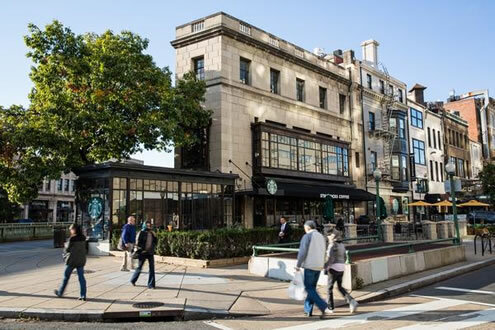 Harbor Group International has paid $16.2 million for the Starbucks Building by Dupont Circle in a sale brokered by Calkain Cos.
A Virginia company has paid $16.2 million for the Starbucks Building by Dupont Circle, marking one of the largest retail sales per square foot in the D.C. region in recent history. Norfolk, Va.-based Harbor Group International has paid $16.2 million for the nearly 10,000-square-foot property at 1501 Connecticut Ave. NW from an affiliate of Lakritz Adler Real Estate Investments in a deal brokered by Calkain Cos. The deal works out to $1,672 per square foot, or about 886 coffees per square foot. Extending the java metric, that's about 8.6 million coffees for the building based on the cost ($1.91) of a tall Starbucks coffee in Rosslyn, where I work. The pricey retail sale follows the deal for the former Nathan's building in Georgetown for about $1,831 per square foot. Calkain Managing Director Rick Fernandez, who part of the marketing team along with Calkain Executive Vice President David Sobelman, said the offering attracted interest from prospective buyers across the globe. "It is a pretty remarkable exit for the property," Fernandez said. "I think [Harbor Group] saw it's a trophy asset, an anchor asset in their retail portfolio." Calkain was retained last fall to market the 9,718-square-foot Starbucks Building, which includes a 3,700-square-foot Starbucks along with additional retail and office space. It hit the market at an asking price just short of $17.5 million and sold for a cap rate of about 4.3 percent, one of the lowest cap rates for a retail-anchored property in the city. Calkain cited other recent sales, including Bar di Bari's space at 1401 R St. NW, which sold in January for nearly $1.4 million, or about $1,087 per square foot. There was also Lululemon's space at 1515 15th St. NW, which sold in September 2012 for $2.4 million, or about $1,041 per square foot, and the CVS at 1749 Columbia Road NW, which sold in August 2012 for $14.5 million, or about $1,154 per square foot. Fernandez noted the price per square foot came in slightly less than Nathan's at Wisconsin and M streets NW, which reportedly sold for $12.2 million to a group tied to sports apparel firm Under Armour Inc. That sale came in at a little more than $1,831 per square foot. The difference, Fernandez said, is that the new Nathan's owners bought the building with plans to open an Under Armour Brand House retail store. The Starbucks property, by contrast, is fully leased to a range of tenants and sold to an outside investor rather than an owner-occupier. Daniel J. Sernovitz covers commercial real estate. Copyright © 2015 LaKritz Adler. All rights reserved.